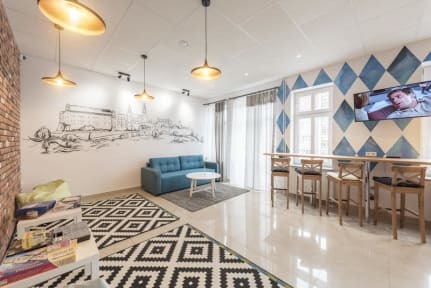 Ginger Hostel is a hostel that unites travelers from around the globe. It is something more than just an accommodation, we want our guests to rest and chill out with other travelers who have the same interests and preferences. Ginger Hostel is located in 5 minutes walk from the Wawel castle and 10 minutes walk from the Old Town. There is a bus and a a tram stop right in front of the hostel (Jubilat), so there will be no problems with getting even to the most distant areas of the city. Bus number 252 goes directly from the Krakow Balice Airport to Jubilat bus stop in front of the hostel. At Ginger Hostel we have rooms for all tastes and budgets, but all our rooms are equally comfortable, because they are spacious, light, have high quality furniture (wooden beds with orthopedic mattresses, luggage lockers for every guest) Enough? But it is not all yet. 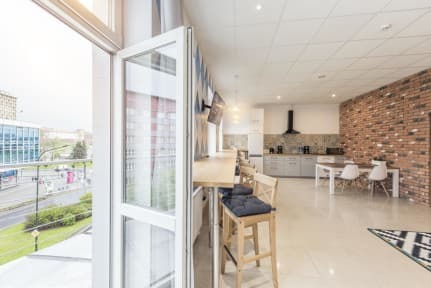 Our guest can use a common lounge area where they can have a cup of tea or coffee and enjoy a gorgeous view at the Wawel Castle. Mornings start with a tasty continental breakfast at Ginger Hostel. Also, if you need transfers or excursion to the most popular touristic directions (and not only) we can book them for you. Hope that you will decide to come to Ginger Hostel. We do our best in order to provide our guests with high quality services that will allow them to enjoy their stay in Krakow and Poland. Super clean and tidy! The breakfast is very nice with loads of food choice! Definitely recommend. This was the cleanest hostel I have ever stayed in! It was a bit difficult to find at first, but I’m so glad that I stayed here. The staff was helpful and served a free breakfast every morning. The rooms and bathrooms are sparkling clean and include large lockers with locks for security. Great location too! Only about 10 minutes from the old town. Had the best time here! Upgraded to private room for free and the staff were so helpful. Nice breakfast and clean facilities. Thank you! The staff were friendly and helpful; it was clean; there is a wonderful free breakfast; location is excellent; highly highly recommend! I really enjoyed my stay there and would definitely come back if around Krakow again. The place is bright, new, well decorated and sparkling clean and only a short walk from the city centre. The dorms have each a bathroom, each bed comes with a spacious locker (I could even fit my massive backpack in!). Bonus point : I left around 4:30 in the morning and there were some breakfast ready for me! Great hostel! Really nice and accommodating staff- they set up breakfast early for us so we could catch an early flight, and held our luggage all day before we checked in. Very convenient location and really nice facilities as well. Hostel is rather small, but all the rooms and facilities are extremely clean. Staff is very friendly and knowledgeable, ask for recommendations, directions, words in Polish, anything they can answer! Location is also very good, just a little over 5 minute walk to the Old Town, and fantastic view of Wawel Castle. The location is great since it's quieter away from the center and 10-15 minute walk away. They keep the place nice and clean and the staff are friendly. Don't like that the room doesn't lock so anyone can walk into the room and did accidentally since it was near a bathroom, at least there are lockers in the rooms. The bed and pillow were not comfortable, my back and neck paid for it, and the individual lights on the beds are way too bright. But it was cheap and breakfast was included.